You can see Janet airplanes at several airports throughout the U.S. You can hear them on air traffic control. You can fly one in Microsoft Flight Simulator X. But you can’t buy a ticket on a Janet flight, and the people who fly on Janet flights can’t tell you, or even their families, what they do for work. It is seemingly an airline that flies to nowhere. The multi-tiered secrecy surrounding the Janet jets, the unusual ways they operate and the places they go are one of aviation’s greatest legends. If it all seems like a big clandestine operation, that’s because it is. Why is there a fleet of unmarked airliners at a guarded private terminal in Las Vegas? Where do they fly? Who flies aboard them? Even though these aircraft service the seemingly impenetrable top secret defense world, we can provide some answers. No, “Janet Airlines” isn’t the shadowy carrier’s official name. That name stuck and became widely accepted once aviation enthusiasts discovered that the curious aircraft based out of a small private terminal (code named “Gold Coast”) on the west side of McCarran International Airport in Las Vegas use the callsign “Janet” while operating in civilian airspace. Profile view of the “Gold Coast” terminal at McCarran International Airport, Las Vegas, NV. It’s when Janet flights cross from civilian airspace into restricted military airspace that things get really interesting. One of the places these Janet 737’s go is located inside the airspace described as R-4808N on the map below. “The Box,” or “The Container,” as R-4808N is known, is off-limits. It is restricted airspace within restricted airspace, and incursions into its sanctum are most unwelcome. And yet, the unassuming white and red 737’s are shepherded through routinely, where they disappear before reappearing after different lengths of time. On takeoff from Las Vegas, Janet flights communicate with McCarran Departure Control using a callsign like “Janet 210,” or “Janet 301.” Once airborne, the Janet proceeds northwest and McCarran Departure hands them off to Nellis Control. Nellis Control supervises the busy airspace across the southern part of Nevada. After checking in with Nellis Control, the Janet then continues into the “Special Use Airspace” described on the map above, but not before Nellis Control approves a frequency change for the Janet. What’s telling in the subtlety of the handoff is what isn’t said; the Nellis controller never specifies which frequency for the Janet to switch to. That’s because the Janet already knows the new frequency. And in addition to the frequency change, it’s callsign has changed, too. It’s no longer “Janet 210” or “Janet 301,” it’s now something else entirely, like “Racer 25” or “Bones 58.” It’s flying inside the most restricted airspace on Earth, heading directly towards a veritable black hole of information. 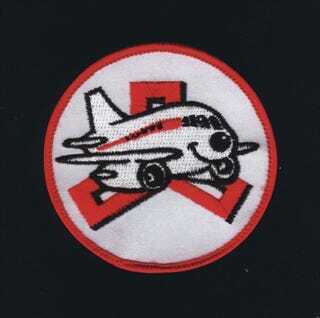 The Janet mission started as far back as the founding of “Watertown Strip,” but then became official in 1972 with a single Douglas DC-6B, followed by an additional DC-6B in 1976. These two aircraft served until 1981, when they were retired and replaced with Boeing 737-200 Advanced jets. The original Janet aircraft, a Douglas DC-6B (registration N6583C) that previously served Northeast Airlines using a different registration. A total of six 737-200’s eventually joined the Janet fleet. Of these six, five had been converted from prior service as USAF T-43A trainers. The sixth had previously flown for Western Airlines before being transferred to government ownership. The Western Airlines livery is thought to be the origin of the simple, anonymous white and red Janet paint scheme that the mysterious airline has become known for and we still see today. In case you don’t remember Western Airlines, they merged with Delta Air Lines in 1987 and maintained hubs in Los Angeles (LAX), Salt Lake City (SLC) and Denver’s old Stapleton site (DEN). N517C, a 737-200 Advanced, which previously operated as a Janet aircraft. This model has since been replaced with a 737-600, which features the same livery. Today, Janet aircraft include a fleet of six white Boeing 737-600 airliners, devoid of any markings other than a registration number and a single red stripe running from nose to tail along the fuselage. Each of the current Janet 737-600’s were previously in service with Air China, beginning their peculiar second life based out of Las Vegas between 2008 and 2009. Several other aircraft are based out of “Gold Coast” terminal in Las Vegas, including two Beechcraft 1900C’s and three King Air twin turboprops which serve similar destinations as the 737’s. The Beech turboprops are painted white with blue stripes, devoid of any markings beyond the registration. While these aircraft typically use their normal registrations as callsigns instead of “Janet,” they are closely associated with the activities of the larger 737’s. Beechcraft 1900C, registration N20RA. N623RA is an identical Beechcraft 1900C. A satellite image of the EG&G Airlift Terminal (code named “Gold Coast”) and adjacent parking lots at Las Vegas McCarran International Airport. All Janet aircraft are owned by the U.S. Air Force, registered either to an office at Hill AFB in Utah, or a PO Box in nearby Layton, Utah. While they’re technically owned by the USAF, the aircraft are currently thought to be operated by a division of the AECOM corporation. Understanding how AECOM came to operate these flights is a convoluted, multi-decade tale of mergers and acquisitions. AECOM, a publicly-traded company (NYSE: ACM) and one of the largest technical and management support firms in the world, acquired URS Corporation in 2014. URS Corporation, which provided engineering and construction management services, had many subsidiaries in the avionics and defense spaces. Two of these URS subsidiaries have connections to Janet flights. The first of these two companies is called EG&G, which URS Corporation acquired from the Carlyle Group in 2002. The other is called JT3, which is a joint venture between EG&G and defense super-contractor Raytheon. EG&G was named after its three founders, Harold Edgerton, Kenneth Germeshausen and Herbert Grier. These men were MIT professors and were widely involved in the Manhattan Project. Harold Edgerton invented the rapatronic camera, which was used to make high speed images of the first milliseconds of nuclear explosions. Nuclear explosion photographed by rapatronic camera less than 1 millisecond after detonation. Following the conclusion of World War II, EG&G became a key contractor for the Atomic Energy Commission, which eventually became part of the Department of Energy. Since the early 1950’s, EG&G performed tens if not hundreds of billions of dollars of work at the Nevada Test Site (now known as the Nevada National Security Site). Entrance to the Nevada National Security Site, previously known as the Nevada Test Site. The Nevada Test Site is where the United States once tested at least 928 nuclear weapons, both in the atmosphere and underground. It lies at the southern end of the Nellis Range Complex, which encapsulates a staggering number of facilities directly or indirectly related to testing secret advanced aircraft, or providing realistic conditions for air combat training, including Red Flag exercises. These are places like Tonopah Test Range Airport, Desert Rock Airstrip, Creech Air Force Base (formerly known as Indian Springs Air Force Auxiliary Field) and, at the heart of the Nellis Range complex, the installation at Groom Lake better known as Area 51. Satellite image of craters at Nevada Test Site. Over time, EG&G’s portfolio of services grew from designing and manufacturing highly specialized testing equipment for nuclear scientists at the Nevada Test Site, to include radar testing equipment as well as logistics and operations management services throughout the region’s various government ranges and installations. Their expansion into providing services in support of flight testing was logical considering the broad scope of the firm’s prior work throughout the Nevada Test Site. Craters at the Nevada Test Site. EG&G’s expanding footprint within the “black world” of defense and intelligence infrastructure makes sense, considering the government’s interest in protecting the classified nature of their activities. The fewer number of parties “in the know” ensures that secrets stand a better chance of remaining just that, secrets. 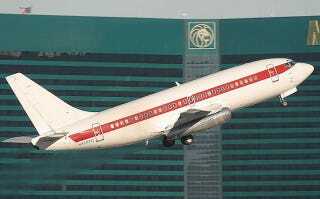 We know that EG&G’s Special Projects Division operated the terminal for Janet flights at McCarran for many years before being acquired. To support this, a Nevada Department of Transportation diagram for McCarran Airport dated May of 1999 labels the building as “EG&G Airlift Terminal.” We also know that EG&G has posted employment ads for 737 pilots in Las Vegas area newspapers as well as online forums. At the time of this writing, AECOM hasn’t yet made a securities filing with the SEC that gives effect to the URS acquisition. Since such reports are done in aggregate, however, it would be highly unlikely that any specific data about EG&G would be mentioned, especially given the highly classified nature of their activities. Being hidden within multiple strata of a corporate hierarchy only further shields EG&G from prying eyes and minds, making it that much more difficult to draw conclusions about what role they play in Janet flights. Speculation has existed for a few years that JT3, the EG&G-Raytheon joint venture mentioned previously, now operates Janet flights. JT3 was formed in 2002 to manage the Department of Defense’s massive Joint Range Technical Services contract, known as J-Tech. J-Tech is the program overseeing management and support activities across four enormous military installations: Edwards AFB, Nellis AFB (and the Nevada Test and Training Range), Hill AFB (and the Utah Test and Training Range) and Naval Air Weapons Station China Lake. With the exception of Hill AFB, Janet flights regularly operate between the J-Tech locations. JT3’s corporate office is located less than 1,000 feet from McCarran Airport’s southern boundary, and less than a 10 minute drive from the “Gold Coast” terminal. Given the overlap in work locations and direct lineage from EG&G’s shadowy corporate history, it is probable that JT3 operates the Janet flights today. Where do Janet aircraft fly? A declassified map showing Groom Lake’s location adjacent to the Nevada Test Site. A 2011 satellite image of Groom Lake, NV. Area 51 has been the site of advanced aircraft research, development, testing and evaluation (RDT&E) for over half a century. It was originally established to provide a secure testing environment for the U-2 high altitude spy plane in 1955, although much of the area around Groom Lake had already been under government control for years. As the nation’s most secretive flight test center, Area 51 played a central role in developing the nation’s most advanced and secretive aircraft. Lockheed tested the A-12 Oxcart and SR-71 Blackbird there, as well as their Have Blue demonstrator, the predecessor to the F-117A stealth attack jet. Northrop’s Tacit Blue aircraft in flight. Northrop tested Tacit Blue at Area 51, the demonstrator which paved the way for the B-2A stealth bomber and likely many other top-tier platforms. Boeing’s Bird of Prey test article. More recently, it is known that Boeing’s internally-funded Bird of Prey stealth jet was tested at Area 51 during the late 1990’s. This program reportedly revolutionized processes for affordable and rapid low observable aircraft design. It is also likely that “Rat 55,” the ungainly looking 737 with radomes protruding from both ends of the fuselage, has operated from Area 51 at some point. As Area 51 has increased in size over its 60+ year history, it is likely that only a fraction of what has actually flown from there has been publicly revealed. Some of this missing history is already lost forever; many aircraft have been buried in unmarked graves at Area 51 over the years, either to ensure that test articles never fall into the wrong hands, or simply to create more space for newer projects. To this day, the base is ever-expanding and new facilities continue to appear on satellite imagery and long-range photography. 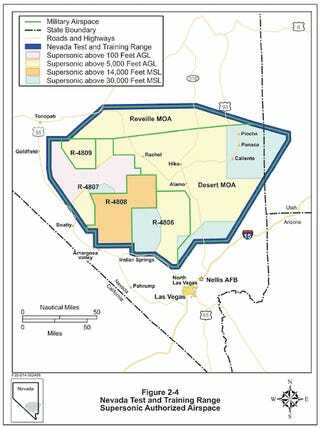 Area 51 is situated inside the larger Nevada Test and Training Range (NTTR), which is made up of many smaller distinct zones with different purposes. Many sections of the NTTR have been assigned other Area “X” identifiers (yes, there is an Area 52). Surrounding Area 51 is the restricted Nellis Air Force Range, covering an immense swath of southern Nevada. Besides Area 51, the location at Groom Lake has been known as many names over the years, or sometimes simply as “nowhere.” At various points in time, it has been called “Watertown Strip,” “Dreamland,” “Paradise Ranch,” “Homey Airport,” “the Area,” “the remote location,” “out of town” and likely many others. For several years, the ICAO code “KXTA” has been associated with Groom Lake in flight planning software and GPS devices as base’s apparent location indicator. Even though the CIA has finally acknowledged the base under the name Area 51, the activities that take place there are nowhere near the public’s eye. This definitely contributes to the base’s intrigue, as do the deceptive measures taken to ensure its security. Satellite image of the Janet ramp at Area 51. Janet flights, which serve Groom Lake multiple times daily during the work week, are perhaps the only aspect of the not-so secret base that is continuously visible to the outside world. In a way, they are hiding in plain sight. Another location where Janet flights regularly operate is Tonopah Test Range Airport (TTR), which is located roughly 200 miles northwest of Las Vegas. Tonopah is officially part of Area 52, and its significance within the “black world” is often associated with the F-117A Nighthawk stealth attack jet. The F-117 was developed at Area 51 but was operational at Tonopah, where it spent almost a decade flying in secrecy during the 1980’s. Although the USAF officially retired the F-117 fleet in 2008 (three years earlier than initially planned) many airframes remain in regenerative storage in their original hangars in Tonopah and spotters continue to record them in flight around the range. Why Is The &apos;Retired&apos; F-117 Nighthawk Still Flying? Tonopah was also home to the 4477th Test and Evaluation Squadron, which operated captured Soviet combat aircraft under a program codenamed Constant Peg. These aircraft (gleaned through a variety of means, including pilot defection) were secretly flown here for decades, giving American strategists vital information about their adversaries, and providing American pilots with a distinct upper hand. The information gleaned from intimately understanding strengths and weaknesses of captured Sukhois and MiGs (which some reports have numbered as high as 26 airframes) has certainly helped to inform tactics and other critical decisions throughout the USAF. Janet aircraft make round trip flights to Tonopah from McCarran every weekday. While Tonopah Test Range doesn’t carry the same name recognition as Area 51, Tonopah has hosted test programs of both American and foreign aircraft that continue to shape the Air Force today. A Janet 737 seen taxiing at Tonopah Test Range Airport. A 2013 satellite image of Naval Air Weapons Station China Lake. The aircraft parked at the “Gold Coast” terminal are known to also visit Naval Air Weapons Station China Lake, approximately 150 miles north of Los Angeles. This installation covers more than 1 million acres and is the Navy’s premier RDT&E facility. It has been described as the Navy’s loose analogue to the Nellis Air Force Range. China Lake’s wider test and evaluation mission for the Navy includes systems integration, operational testing of new weapons, sensors and tactics, tactics development, electronic warfare, unmanned systems, the affects weapons have on airframes, and others. The Navy has developed front-line munitions at China Lake, including the AIM-9 Sidewinder heat seeking air-to-air missile, the Tomahawk cruise missile and many more. This suggests that workers arriving on the Beech turboprops based at the “Gold Coast” terminal could be supporting missile research and testing programs for the Navy, or integrating weapons into aircraft under development at the other Janet destinations. A 2015 satellite image of Air Force Plant 42 at Palmdale, CA. Palmdale, California is home to United States Air Force Plant 42, a sprawling industrial complex and airfield in which defense contractors manufacture and service some of the most advanced aircraft in aerospace history. Entrance plaza at the Lockheed Martin Skunk Works facility in Palmdale, CA. It is the location of Lockheed Martin’s often-imitated Skunk Works advanced projects division, which created jets like the U-2 Dragon Lady, SR-71 Blackbird, F-117A Nighthawk. Likewise, Northrop Grumman manufactured the B-2A Spirit stealth bomber and the RQ-4 Global Hawk in their Plant 42 facilities. Boeing also operates a facility at Plant 42, and Rockwell manufactured the Space Shuttle orbiters there as well. Each of these prime contractors operate within their own separate areas at Plant 42, the high level of activity taking place inside each of their massive windowless buildings juxtaposed against the near-complete lack of activity outside. Lockheed Martin’s Skunk Works division logo appears on the exterior of their building in Palmdale, CA. The USAF is currently in the process of selecting a build team for its new Long Range Strike Bomber (LRS-B). The LRS-B program will replace aging B-52 and B-1 aircraft with 80-100 modern, stealthy bombers that can be upgraded with new capabilities over time. Northrop has indicated that it intends to build its version of the deep penetrating weapons platform at Plant 42 if chosen the winner, and the combined Lockheed Martin-Boeing team would likely do the same. Prototype versions of the LRS-B may have been spotted flying over Texas and Kansas last year, and with a decision announcing the winning design expected either later in August or early in September, activities at Palmdale are on the cusp of significant expansion. Janet 737’s have been seen at Palmdale, but regular flights between Plant 42 and Tonopah, Groom Lake and McCarran are usually made on the smaller Beech turboprops. A 2012 satellite image of Edwards AFB, CA. Immediately to the northeast of Palmdale is Edwards AFB, another vast complex encompassing many distinct operations. Among these are the Air Force Test Center (AFTC) and USAF Test Pilot School as well as NASA’s Neil Armstrong Flight Research Center. Because it is located next to the expansive Rogers dry lake bed, Edwards benefits from many extremely long runways, which are especially useful for testing high speed aircraft. As a result, many space shuttle landings occurred there, and Edwards is an alternate landing site for returning X-37B robotic shuttle missions. It is also where most X-Planes have been tested, and where then-Captain Chuck Yeager first broke the sound barrier in the Bell X-1. When the Beech turboprops make their regular flights between Edwards and the Tonopah Test Range or Groom Lake, they likely aren’t shuttling workers in support of the visible, non-classified research and test programs occurring at the base. Instead, they are much more likely to be supporting activities at the Air Force Test Center’s Special Projects branch, which oversees testing for “black world” aircraft. North Base at Edwards AFB, on the northwest corner of Rogers Dry Lake bed. These special undisclosed projects are managed at the highly secretive North Base, which is not surprisingly located on Edwards’ northern side. North Base is very much its own outpost, separated from the main Edwards ramp by several miles. It is also the site of the Air Force’s Electronic Warfare Directorate, which tests and evaluates the latest cyber capabilities and strategies. North Base is sometimes referred to as Operable Unit 10, and is where the King Air twin turboprops most often land. To the North of Edwards AFB is the Mojave Space Port where Scaled Composites (a division of Northrop Grumman) and other cutting edge aerospace firms reside. Janet flights aren’t known to operate there, but if individuals from those firms needed to be flown to a regular destination, Edwards or Palmdale are both nearby. A Janet 737 undergoing maintenance at Delta TechOps in Atlanta, GA.
Janet 737’s are occasionally seen at Atlanta’s Hartsfield-Jackson airport where they undergo maintenance and overhaul at the Delta Air Lines’ TechOps maintenance facility. USAF C-40 Clipper jets, which are a military derivative of the Boeing 737-700, also undergo maintenance at the same facility. Janet 737’s are also said to be serviced at Paine Field in Everett, Washington. Janet flights may serve other locations throughout the military and intelligence apparatus, and very likely make unique visits to atypical destinations under special circumstances. Some of these places are in or near southern Nevada, and others are many thousands of miles away. On September 26th 1994, a suspicious incident reportedly took place at Boscombe Down in the U.K., which has been the subject of immense speculation and intense interest ever since. According to witness reports, an unknown and highly classified aircraft, charcoal grey in color and featuring inward-canted tail fins, experienced a malfunction during takeoff and crashed near the runway. Security forces immediately swarmed the crash site, apparently covering the wrecked aircraft with tarps to conceal its shape. Witnesses reported seeing many unusual aircraft begin to arrive at Boscombe Down, presumably to manage the situation and ensure the secret plane’s identity and purpose remained concealed. Among these arrivals included a giant C-5 Galaxy cargo jet, on which the secret wreckage was said to be loaded. From Boscombe Down, the C-5 reportedly flew directly to Plant 42 in Palmdale, California. A Janet 737 was also said to have been spotted arriving at Boscombe Down shortly after the crash. We don’t know what, if anything, actually happened at Boscombe Down, so the mystery will likely always be part of the Janet lore. The Beechcraft from the “Gold Coast” terminal have been seen at Basecamp, a remote site that was once operated by the Atomic Energy Commission before being reclaimed by the USAF. It is said to be used as a staging and support area for test activities at both the Tonopah Test Range and Area 51. EG&G has provided technical services at Kirtland AFB (known for conducting advanced research in airborne laser weapons) and Holloman AFB (former home of the F-117), as well as White Sands Missile Range. It is unconfirmed, but certainly possible and perhaps even likely, that Janet flights have operated at any or all of these locations throughout New Mexico. Vandenberg AFB on the central California coast. Other especially-secretive installations where Janets could occasionally operate include Vandenberg AFB in California, which is an enormous space complex used to launch rockets with classified payloads. Vandenberg was designated the west coast launch site for the Space Shuttle (although none were ever launched there) and has served as the landing site for the first three highly-secretive X-37B robotic space plane missions. Michael Army Airfield (DPG) at Dugway Proving Ground, Utah. Dugway Proving Ground in western Utah is another potential destination for Janet aircraft. The secretive Army facility is where extensive chemical and biological weapons testing has occurred, among other discreet purposes, since the early 1940’s. Dugway is located just a few miles south of the Utah Test and Training Range, which is one of the four areas in the J-Tech contract managed by JT3. If true, or even partially true, the story of the Cheshire Airstrip could also involve a Janet flight. Apparently, somewhere within or near Area 19 in the northern part of the Nevada Test Site is a hidden runway, totally camouflaged to match the surrounding terrain. According to legend, the runway is capable of revealing its location as needed, using a system of sprinklers to quickly unveil its dimensions. Claims have suggested that a 737 could theoretically be capable of operating from the mysterious vanishing airstrip. Although this story is probably just part of the Janet and Area 51 lore, it is an example of the interest into Area 51 and its logistics. The ranks of the American military and intelligence communities have included countless incredibly brilliant minds. This collective brainpower is what has made the country’s aerospace industry a global leader. Circulating key people among the litany of bases and ranges is the reason why Janet flights exist, but their significance is so much greater than their simple, unassuming appearance. The Janet aircraft and the destinations they serve are the stuff that sends conspiracy theorists’ imaginations running wild. The truth, however, is that several Janet flights leave from McCarran every weekday morning, full of casually-dressed passengers, to places where some of the most advanced development work in all of aerospace is occurring. It is difficult to appreciate the true scale of the bases and workforce that continuously advances America’s military aviation capabilities until it is possible to see how they are connected. Taking into consideration the need for a substantial fleet of aircraft just to enable daily operations at Area 51, it becomes easier to understand that many thousands of people could have flown on Janet flights over the years. Ultimately, the Janet story is more than the aircraft, the callsigns, the terminal and the corporations; The Janet jets are the narrow visible bandwidth of a much broader spectrum of “black world” places and projects. At its core, Janet Airlines is the heart of an entire clandestine defense ecosystem that is spread across the deserts of the American southwest, pumping talent and brain power to some of the most advanced technologies mankind has ever developed. Flight Club sends our most sincere thanks to artist and author Trevor Paglen for granting special permission to use his images in this article.